In the decades after World War II, evangelical Christianity nourished America’s devotion to free markets, free trade, and free enterprise. 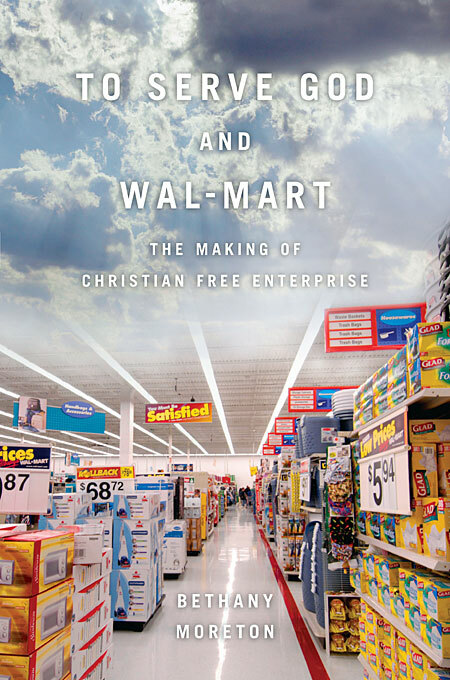 The history of Wal-Mart uncovers a complex network that united Sun Belt entrepreneurs, evangelical employees, Christian business students, overseas missionaries, and free-market activists. Through the stories of people linked by the world’s largest corporation, Bethany Moreton shows how a Christian service ethos powered capitalism at home and abroad. While industrial America was built by and for the urban North, rural Southerners comprised much of the labor, management, and consumers in the postwar service sector that raised the Sun Belt to national influence. These newcomers to the economic stage put down the plough to take up the bar-code scanner without ever passing through the assembly line. Industrial culture had been urban, modernist, sometimes radical, often Catholic and Jewish, and self-consciously international. Post-industrial culture, in contrast, spoke of Jesus with a drawl and of unions with a sneer, sang about Momma and the flag, and preached salvation in this world and the next. 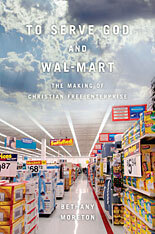 This extraordinary biography of Wal-Mart’s world shows how a Christian pro-business movement grew from the bottom up as well as the top down, bolstering an economic vision that sanctifies corporate globalization. The author has assigned her royalties and subsidiary earnings to Interfaith Worker Justice and its local affiliate in Athens, GA, the Economic Justice Coalition.